Last Friday, April 24, we remembered how exactly 100 years ago the last historic Muslim caliphate, the Ottoman Empire, tried to cleanse its empire of Christian minorities — Armenians, Assyrians, and Greeks — even as we stand by watching as the new caliphate, the Islamic State, resumes the genocide. In November, 1914, during WWI, the Ottoman caliphate issued a fatwa, or Islamic decree, proclaiming it a "sacred duty" for all Muslims to "massacre" infidels — specifically naming the "Christian men" of the Triple Entente, "the enemies of Islam" — with promises of great rewards in the afterlife. The same Koran verses that the Islamic State and other jihadi outfits regularly quote permeated the Ottoman fatwa, including: "Slay the idolaters wherever you find them — seize them, besiege them, and be ready to ambush them" (9:5) and "O you who have believed! do not take the Jews and the Christians for friends; they are but friends of each other; and whoever among you takes them for a friend, then surely he is one of them" (5:51) — and several other verses that form the Islamic doctrine of Loyalty and Enmity. Many Muslims still invoke this doctrine; it commands Muslims to befriend and aid fellow Muslims, while having enmity for all non-Muslims (one Islamic cleric even teaches that Muslim husbands must hate their non-Muslim wives, while enjoying them sexually). As happens to this very day, the Muslims of the Ottoman caliphate, not able to reach or defeat the stronger infidel — the "Christian men" of Britain, France, and Russia — satiated their bloodlust on their Christian subjects. And they justified the genocide by projecting the Islamic doctrine of Loyalty and Enmity onto Christians — saying that, because Armenians, Assyrians, and Greeks were Christian, they were naturally aiding the other "Christian men" of the West. As happens to this day under the new caliphate — the Islamic State — the Ottoman caliphate crucified, beheaded, tortured, mutilated, raped, enslaved, and otherwise massacred countless "infidel" Christians. The official number of Armenians killed in the genocide is 1.5 million; hundreds of thousands of Greeks and Assyrians each were also systematically slaughtered (see this document for statistics). Will the outrageous terrorizing, the cruel torturing, the driving of women into the harems, the debauchery of innocent girls, the sale of many of them at eighty cents each [today the Islamic State sells enslaved Christians and Yazidis for as little as $43], the murdering of hundreds of thousands and the deportation to, and starvation in, the deserts of other hundreds of thousands, the destruction of hundreds of villages and cities, will the willful execution of this whole devilish scheme to annihilate the Armenian, Greek and Syrian [or Assyrian] Christians of Turkey – will all this go unpunished? Because this genocide of Christians is usually articulated through a singularly secular paradigm — one that recognizes only those factors deemed intelligible from a modern Western point of view, one that never uses the words "Christian" and "Muslim" but rather "Armenian" and "Turk" — few are able to connect these events from a century ago to today. War, of course, is another factor that clouds the true face of the genocide. Because it occurred during WWI, so the argument goes, it is ultimately a reflection of just that — war, in all its chaos and destruction, and nothing more. This has been the stance of all successive Turkish governments. Turkish President Erdogan, who staunchly denies that his ancestors committed genocide against Christians by arguing that they were just wartime casualties, also absurdly accused China of committing "genocide" in 2009, when less than 100 Muslim Uighurs were killed in clashes with Chinese security. A century later, Christian minorities are still being systematically decapitated, crucified, tortured, raped, and enslaved. War was — and, as shall be seen, still is — a pretext to sate jihadi barbarity. Winston Churchill, who described the genocide as an "administrative holocaust," correctly observed that "the opportunity [of World War I] presented itself for clearing Turkish soil of a Christian race." Talaat Pasha, one of the Ottoman Empire's "dictatorial triumvirate" during WWI, pointed out that "Turkey is taking advantage of the war in order to thoroughly liquidate its internal foes, i.e., the indigenous Christians, without being thereby disturbed by foreign intervention." A century later, consider how Christian minorities today are still being systematically decapitated, crucified, tortured, raped, and enslaved — also under the pretext of war. In every Arab nation where the U.S. has helped oust (secular) autocrats — Iraq, Libya, Syria — indigenous Christian minorities have been massacred by the jihadi elements that were once contained by Saddam Hussein, Muammar Gaddafi, and Bashar Assad (read here for details). 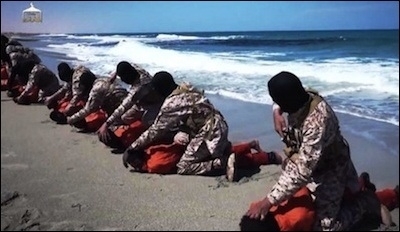 The Islamic State's recent slaughter of some 30 Christian Ethiopians in Libya — and two months earlier, 21 Christian Egyptians — is merely the latest serving of Christian persecution in post "Arab Spring" Libya. Nor is this limited to the Arab world. In Muslim-majority northern Nigeria, Muslims, spearheaded by the Islamic organization Boko Haram, are waging a savage jihad on the Christian minorities in their midst. Boko Haram's stated goal is to cleanse northern Nigeria of all Christians — a goal that should be reminiscent by now. But even in non-war-torn nations, from Indonesia in the east to Morocco in the west, from Central Asia in the north, to sub-Sahara Africa — in lands of different races, colors, languages, politics and economics, in lands that share only a Muslim majority — Christians are, to varying degrees, being eradicated. Indeed, in Turkey today, even indigenous Turks who convert to Christianity are regularly persecuted and sometimes slaughtered in the name of Islam. 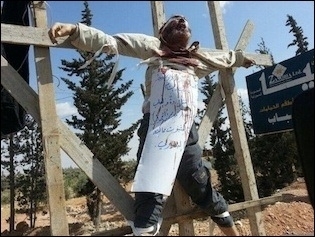 See my book, Crucified Again: Exposing Islam's New War on Christians, for a comprehensive account of what may eventually culminate into the Genocide of the 21st century. There is no denying that religion — or in this context, the age-old specter of Muslim persecution of Christian minorities — was fundamental to the genocide of Armenians, Greeks, and Assyrians. Even the most cited factor, ethnic identity conflict, while legitimate, must be understood in light of the fact that, historically, religion sometimes accounted more for a person's identity than language or heritage — certainly it did for Muslims, in context of Loyalty and Enmity. This is daily demonstrated throughout the Islamic world today, where Muslim governments, mobs, and jihadis persecute Christian minorities — minorities who share the same ethnicity, language, and culture as Muslims, but not religion — often in retaliation to the West (just as the Ottomans, as seen, were also "retaliating" to the Triple Entente). Indeed, if we "fail to deal radically" with the "horror" currently being visited upon millions of Christians around the Islamic world — which in some areas has reached genocidal proportions according to the United Nations — we "condone it" and had better cease talking "mischievous nonsense" of a utopian world of peace and tolerance. Put differently, silence is always the ally of those who would commit genocide. In 1939, on the eve of World WWII, Hitler rationalized his genocidal plans against the Jews, when he reportedly asked: "Who, after all, speaks today of the annihilation of the Armenians?" And who speaks today of the ongoing annihilation of Christians under Islam?